Since the 1990s, the Circumpolar Active Layer Monitoring (CALM) program has conducted long-term studies of the response of the Arctic permafrost to climate change. Every summer, a certain depth of the top layer of the tundra's permafrost thaws and this is known as the ”active layer”. The depth of this layer is dependent on a number of variables, including biomass cover and air temperature. The impacts of thawing have direct effects on the flux of greenhouse gases, on human infrastructure and on landscape processes. Monitoring of the permafrost is therefore essential for the Arctic community. The CALM network has over 125 sites in both the northern and southern hemispheres and involves participants from 15 countries. 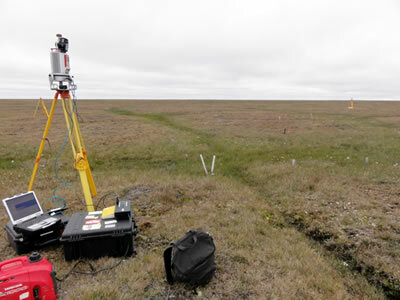 A series of sites are located just outside of Barrow, Alaska, in the Barrow Ecological Observatory (BEO), a 1 km² area reserved for scientific study of the tundra. 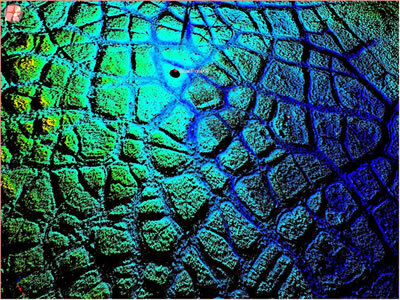 In August 2010, five 10m x 10m study sites were scanned into 3-dimensional georeferenced data sets using a Terrestrial LiDAR System (TLS). Figure 1 shows the instrument set up among the polygonal features that characterize the landscape, while Figure 2 depicts a screenshot of TLS data from one of the sites. The data will be used to characterize the subsurface geometry of ice-wedge networks and relate it to the surface expression. Figure 1 - Scanning in the BEO on a typical day in Barrow. The green linear features are water-logged cracks in the earth that will freeze and expand in the winter, creating ice wedges. Figure 2 - A geo-referenced image of the landscape clearly defines the polygonal features that dot the landscape. The color scale represents true elevation and allows us to see larger-scale landscape features.